Arriving after dark, we followed one of the many touts awaiting our bus to a nearby hotel. After being showed a number of rooms with dubious toilet situations and fans literally swinging from the roof we settled on room 402, a shoebox with a curtain acting as the bathroom door. The next day was spent running errands - laundry desperately needed doing post Kili and a bus to lamu to be arranged. Not to mention applying for grad jobs from the opposite side of the world. We thought we'd reward ourselves with a nice dinner at the famous Tamarind restaurant (really part birthday present for Mads). Pretending it was a surprise first wedding anniversary, in order to get a nice table and some special treatment, we caught a tuk-tuk across town and settled into an amazing view overlooking the river mouth. Starting off with cocktails, it progressed into an amazing dinner. 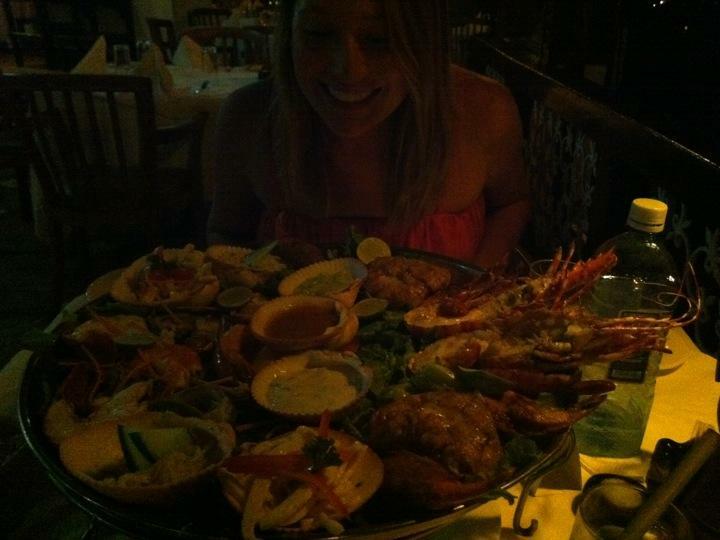 Mombasa prides itself on seafood and Tamarind definitely didn't disappoint. Oyster amuse-bouches, giant crab claws and pâté served as entrees. For main course we ordered the seafood platter for two and were dished up more hot and cold prawns, calamari, oysters, kingfish, crab and lobster than we could eat. We stuffed ourselves to the point of pain, but had to send back some prawns and oysters to the kitchen, with fantastic olive bread and some dips also left uneaten. The food, service and location was as good as you could expect from most quality Melbourne restaurants. We returned to our guest house after what was the best meal we've eaten in Africa. The next day we were up early for a bus to Lamu. Coasting through Malindi, an Italian resort town boasting as many Italian signs as Swahili, we finally arrived at the ferry point to Lamu. While not expecting a Zanzibar style large-ferry, we were surprised and a little concerned when we were ushered onto a tiny barge, handed a fluorescent life vest that would struggle to keep a toddler afloat, and set off. The sea was fairly choppy, and with the wind kicking up the spray off the bow, within minutes we, and our bags, were soaked. A half hour of wet spray later we arrived on Lamu island, about one hundred kilometers south of the Somalian border. We followed a 'registered tourist official' to the guesthouse we were intending to stay at anyway, and Mads bartered the room down to half the asked price. Dumping our wet gear, we headed off in search of beers, despite once again facing the prospect of hunting alcohol on a Muslim island. We did succeed, at a large price, and had a few Tuskers before a quick, cheap dinner of rice/chips and beef before bed. Our first day on Lamu was hectic. We walked to Shella beach, a few kilometers away, sat on the sand for a while replenishing the tan we'd lost on Kili, then bummed about for the afternoon, reading and eating pastries. The next day consisted of a similar thing, but change beach with sitting in a coffee shop/book exchange and getting some much needed new reading. We lazed away our time on Lamu wandering through the ancient lane ways (there are only two cars on the island so even the "main street" is not much wider than one of the many donkey karts providing transport), admiring the authentic Swahili architecture - more Arab than African, relaxing and doing nothing for a while. Tomorrow morning we are up early for a boat ride back to the mainland and bus back to Mombasa, then on to big, bad Nairobi.